I never met Lori Rausch. She seems to have left quite an impact on those that she encountered in her life, which was cut short in 2011. Her sister Tenley came to us at Midwest Musical Imports to have her old bassoon, a Polisi Artist model, refurbished and sold from Lori’s estate. 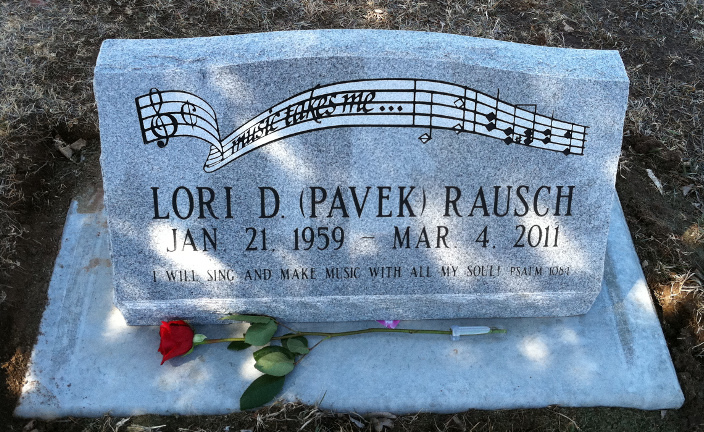 The classic song “Somewhere Over the Rainbow” was apparently quite important to Lori; she used it frequently teaching music classes in South Dakota. The opening motif from the song is on her headstone. Tenley asked me if I would provide one more memory of Lori for her and her sisters by playing “Somewhere Over the Rainbow” on Lori’s bassoon for them. I was more than happy to oblige, and took an arrangement by a friend of a friend (thank you Peter) for trombone quartet, edited it for bassoon quartet and recorded this for them. I am playing all four parts to the arrangement on Lori’s bassoon.